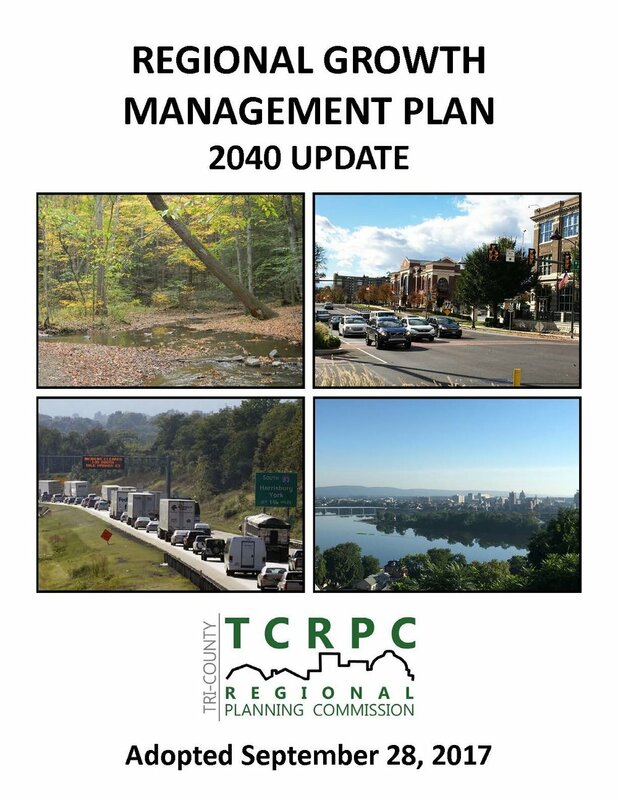 In September 2017, the Tri-County Regional Planning Commission formally adopted the 2040 Update of the Regional Growth Management Plan. The RGMP is a functional, “30,000 foot” plan for the region, focusing on guiding physical development to areas in which public investments in infrastructure and services have already been made, as well as protecting and enhancing our natural, cultural, historic and scenic resources. The studies and analyses contained in the plan and the resulting policy statements will serve as a frame work for use by the region’s counties and municipal governments in their own plan development. The Pennsylvania Municipalities Planning Code, Act 247, gives municipalities, not counties or regional entities, the power to manage and regulate land use. Therefore, inter-jurisdictional cooperation is vital to ensure the RGMP fulfills its purpose. The purpose of the RGMP is to address the broader multi-jurisdictional issues from a regional perspective, to act as an informational resource, and to provide an overarching model for development of more detailed and specific county and municipal comprehensive plans. It is intended to be a plan that ensures the long-term sustainability of our region’s land use and economic development for the benefit of our region’s citizens, business owners and visitors. Like other public infrastructure such as sewer and water service, transportation infrastructure is a driving factor in regional land use planning and the formulation of the Regional Growth Management Plan. Access to transportation facilities and systems directly affects how much population, housing and employment growth our region’s communities can support. Likewise, the various land uses that are allowed by municipalities affects the level of travel demand and where subsequent infrastructure investments need to be made. Transportation infrastructure requires a significant capital investment and lasts for decades, making coordination between land use and transportation efforts vital. Without this coordination, significant investments in transportation infrastructure can go underutilized and dispersed development can cause unnecessary economic burdens in developing new transportation facilities. Integrating and coordinating land use and transportation planning improves the livability and sustainability of our region’s communities. Developing communities that encourage access to transit, improve bicycle and pedestrian connectivity and provide links between where people live, work, shop and play not only enhances the livability and sustainability of those communities, it also reduces the pressure on our transportation facilities and the need for future investments and the resources (i.e. taxes, fees) they require. The spatial relationship between jobs and housing is a significant factor in both land use and transportation planning. Decreasing density also reduces transportation options, making transit service more difficult for the resident and more expensive for the provider. Traditional transit systems, like our region’s CAT system, are based on a “hub and spoke” model, with routes radiating out from a central location. When jobs or houses are concentrated in that central location, the system works well. But when jobs and houses move away from that central location, transit service becomes less convenient, efficient and effective. For our region’s car-less residents, the lack of reliable transportation choices presents a significant obstacle to getting from home to work, school, shopping or any other daily activity. Our region’s residents with cars are also affected by these spatial relationships. Commute times, according to US Census data, are increasing throughout the nation and in each of our region’s counties. This phenomenon has an impact on not just our region’s residents, who are spending more time and money getting to and from work, but also on our region’s economic strength as well. Economic development relies on access to labor markets, which is directly tied to our residents’ ability to get to and from those jobs. Making sound land use decisions while considering transportation and economic development will ensure that our region remains a place people want to live and businesses want to locate.